Kabinett or Spatlese what is your choice? 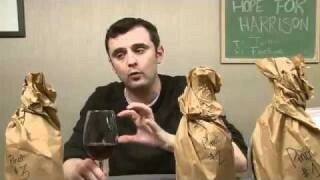 Gary Vaynerchuk goes through the white grape that has his attention these days. Please join us and leave a comment if you haven’t yet. I usually shy away from Riesling because of the too “Sweet” flavor I have always come across but after seeing this episode I am going out and trying more!! Send one in from PR…that’s enough. Take a true break. Enjoy the Boricua’s…fantastic people / place. 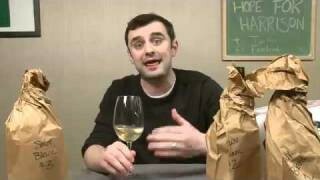 Gary, given your admitted fetish for Riesling, could you also do an episode on GewÃ¼rztraminer? I’ve used the latter, with it’s sweetness, to compliment spicy foods. Also, take some time off and don’t worry about the Vayniacs, we’ll muddle through while you enjoying your much-needed vacation. Very Late comment my apologies. Anyways G-Man take the vacation, enjoy you earned it. No need for shows until you get back. 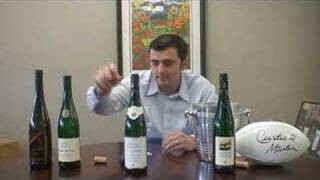 Big-ups on the Riesling, just next time give JJ Prum some love, I mean he’s like the godfather. Have some respect. QOTD: I think people will really have a hard time finding this guys stuff, but theres a winemaker named Joe Otos, who does stuff for a label called Owl Ridge and Willowbrook. His Pinots are ridiculous, Owl Ridge is a custom crush facility in Sebastopol that does stuff for Dumal and tons of great producers. Anyways if anyone can seek this guy out his stuff is killer. 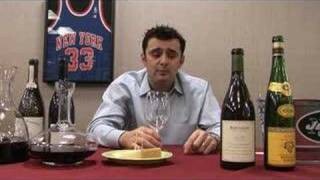 He did an 04′ Dutton Morelli Pinot, unbelievable. No, I am serious, I was just waiting for this kind of episode. More of this. Why? Well, I suppose as wine drinker I was trained on Riesling and especially these Mosel-Saar-Ruwer ones. It just across the border for me (100 km): no distance from the one and only wine Walhalla, Winehalla, Weinhalla :-D. My passion for wines did not really start with just “that singular great bottle” (of d’Yquem 1945), no, I just kinda rolled into it with Italian wines. Love them as you know, but then I think the German wines did the trick. It was with them I had the first awe inspiring experiences, and, so, for me still they are just ‘it’ (whatever that means). This cleaness, pureness, extreme focus, terrific balance and perfect integration of sweety, almost overripe fruits and high toned acidity are to be found in almost no other wines. This aromatic potential gives them such a huge structure, easily supporting botrytis, slate, kerosine, those ‘enfleurage’-scents, I dunno, I always go nuts about them when I have a good one. It’s also the most guarded part of my cellar: nobody will touch them, nobody will choose them, I know it’s nerdy and peevish but you know, I, just being a student, can afford these great wines! I completely agree with you on the Von Hovel and the Haart, they are both great (had them a few weeks ago on a fair). As for the Gunderloch … I dunno, I always give them a try, and they never seem to please me: to sweet (as for the balance), a little bit fuzzy on the finish, no lift, … to my (very humble) opinion they are overrated (didn’t it just all start with a WS-article?). I always doubt my own palate when tasting them. Just everybody says they are great, the greatest, the supreme, the epitome, … but my palate says ‘no’ (as the computer in Little Britain 😉 ). Am I wrong? It’s just that I go for my own to the Mosel-Saar-Ruwer, Nahe or Rheingau and have had much better, I think: Loosen, Thanish and LAUERBURG (especially the last one, disgrace that this small producer is unknown) or Molitor, BÃ¼rklin-Wolff’s Wachenheimer Gerumpel, … I get emotional when I talk about these wines. Especially the Lauerburg: he has the botrytis and kerosine on his hands, it’s not that all his wines are superb, but when they are (i.e. 1999 Bernkasteer Lay Auslese) then they are beyond any comparison: focus (yes that’s what it’s all about for me), abundancy of honeysuckle, pineapple, kiwi, lime zest-confit, curry, iodine, kerosine (it’s almost as if they crush the rock and throw it in the tanks). Just try it. His Doktors Auslese and SpÃ¤tlese 2005 are of that one and sole class of wines you ‘ll never forget. Haaaaaaaa, anyway … QOTD: yep I’m into Riesling. Other varietals: Nero (Uva) di Troia, Pinotage and recently Barbera. 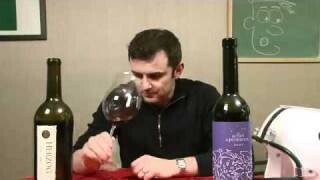 I am preparing a Barbera d’Asti tasting for March. Great wines, really good QPR, but then, the Asti-growers are becoming aware of their potential … . Maybe an idea for another episode? Barbera? VACATION: Time away from the every-day-routine! Leave us without episodes so we will be gasping for your return routine! 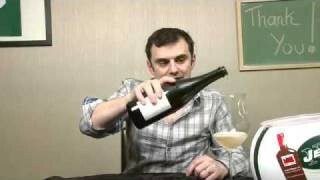 RIESLING: Way to go, Gary! Now you have turned your Vayniac hordes onto a well kept underpriced secret! I love Rieslings and have been telling my friends that this is the grape to go to with spicy foods and seafood.Good by under $15 bottles! St.Urbans-hof, now there is a wonderfulbargain wine. 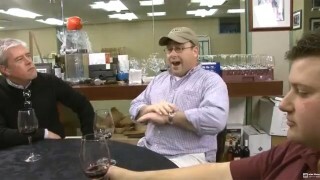 Love the Riesling Episode. I lived in Germany for a few years, really developed a taste for Riesling. One suggestion – “Spatlese” is pronounced SCHPAWT-LAY-ZA (not SCHPAT-lace). Anyway, Cool episode! Have a great vacation! Gary, you have singlehandedly created a new (expensive!) habit for me. I haven’t had a Riesling in a long time but it was the first type wine I ever tried. I remember it being sweet sweet SWEET, and the glass I had on New Year’s day brought back the same memories – way too much sugar for me to want to drink it at any other time than at dessert. I’ve kind of become a Shiraz snob lately, so I’m looking forward to the bottles I just ordered from this show to help switch things up a bit. And thanks for tasting a few Chenin Blancs. The bottle I ordered from you guys was awesome. He shoots he scores on the VAYNER-BOUNCE! Cool beans Gary. Have a great vacation with family. We’ll miss you, but please do NOT tape any episodes while gone. As others have said here it defeats the purpose of the vacation if you’re working. When you come back you’ll be full batt and the creative vino juices for more EPs will be flowing. I fully appreciate the complexity and value of the German Rieslings, but admit we don’t buy them enough because we enjoy less the ones that tend toward sweetness; the trick is finding the right ones. QOTD: Drinking more wines lately with tempranillo to explore this varietal. If I drink white wine, I won’t have the “I drink wine for the health benefits” excuse for drinking wine. I totally go through the grape-type phases. 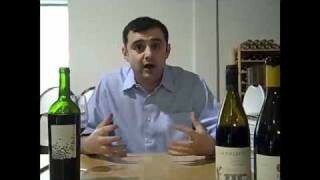 I’m currently hooked on da Syrah – going through 3-a-week to find the bliss. So far, the best is the Clos Pegase Syrah/Cabernet blend over any syrah varietal. So much of that clove and anise spice, I want to eat the glass that it’s poured into. I dug up a 2002 Delicato Syrah 3L Bota Box (the brand/vintage/type 90-point box wine – Wine Enthusiast) from my local grocery store. They had “stored” it on the shelf in the back behind the 2003 and 2005 vintages Bota Boxes and on sale for $12.99 (the amount of 4 bottles of 90-point wine for under 13 bucks!). I’ve been drinking it and it is a 90-pointer – fruit bomb, super-jammy black fruit, not enough syrah spice as I like, but great QPR overall and probably the last time I will find the 2002, though other years have ranked high for the money. I am currently on a Sauvignon Blanc trip – this grape is so interestingly different, depending on where you plant it. I’ve lived in Friuli (northeastern Italy) for 2 years and they make lovely Sauvignons there (especially the “collio”), but I’ve also had some from New Zealand (Cloudy Bay, or the one from the Ornellaia – founders, Campo di Sasso), Chili (tried that Casa Lapostolle Gary recently commented on) and I’m still not tired of it, because everyone of those goes in a completely different direction. By the way, Gary: you think German Rieslings are Grand in 2005 – for the sake of the whole wine community: try some Austrian Whites! Rieslings, GrÃ¼ner Veltliners, Pinot Blancs – they are amazing and already hard to find! Thank you for this episode! 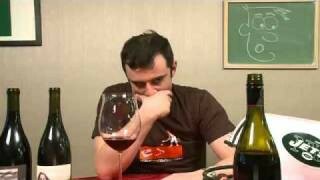 I’m so tired of arguing with my friends over German Riesling and the whole sweetness perception. The best white wine I have ever had was a German Riesling. And I mean it’s not even close. And I’m not particularly a fan of sweet wines. One thing I wanted to ask you about though is your preference for drinking them young. I mean some of these wines have like 10-20 year drinking windows. Do you think drinking or at least judging them at this stage can be a tad unfair. I mean that disjointed, closed bottle might evolve into something more memorable down the line. No? I just came back from VayK and am catching up on the back episodes. Take the time off and don’t do the show. If you don’t take a break I will punch you in the face with a lemon pie. Enjoy the time off and get a tan man. Ok, I’m catching up after that Saints loss. I love Riesling. I wish you wouldn’t talk about it much either because I don’t want the prices to freaking skyrocket. QOD: Zin. I can’t believe it because I really hated it a while back. Just an FYI it’s pronounced “spate lazey” in German. Great episode GV! I adore riesling, its really the grape that got me turned onto wine. QOTD: Drinking a lot of syrah right now, but this episode has inspired me to go and stock up on some of the ’05 rieslings in the next couple weeks. I knew the ’05 was supposed to be amazing, and it looks like it is. I think I will go for some of the lesser known labels, as it appears “even Poppa Smurf” coulda made good German riesling in 2005. Cheers, GV! Solid episode. It’s been a while since I had a Riesling but my mouth is watering for one right now. QOTD – Lately it’s been 05 Baudry Chinon Les Grange and 05 Ladoucette Pouilly Fume, some 05 Palacios Bierzo and 04 Atalayas Ribera del Duero – still finding lots of great 04’s in Spain and Italy. Love the rieslings. Maybe my favorite grape. S.A. Prumm Essence is one of my always-on-hand wines. Not as good as the ones you tried here, but easy to get and a very nice QPR. 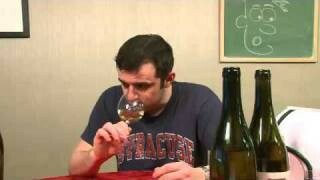 qotd: at the moment the savagnin grape, especially the vin jaunes. although, i can feel corvina is gonna be the next one i get hooked on.